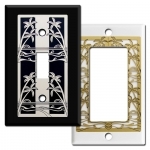 Create the home you've always wanted with Kyle Design decorative switch plates. Handcrafted in the USA in a wide array of designs, finishes & sizes, you can complete any room and get that "Wow!" factor. 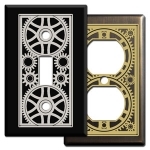 Metal artist Kyle McKeown Mansfield has been crafting custom switch plates for years. Her attention to detail, artistic skill and creative flair has earned Kyle recognition in various publications such as the book Profiles Who's Who in American Crafts. 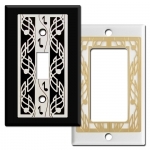 You'll also find many of the above face plates are popular on Pinterest. 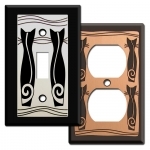 You can decorate your home with her masterpieces by ordering your own custom decorative light switch covers above. Find more unique metal gifts on her decorative gift site Kyle Design. 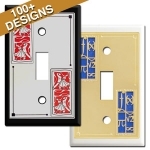 Kyle's decorative cover plates come in a variety of elegant finishes and are custom made in the configurations that you need in your home. 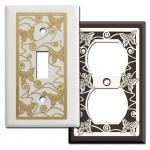 You'll find over 100 sizes in most patterns of Kyle Design's switch plates and outlet covers. 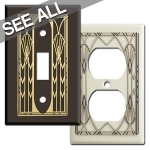 Decorative wall plates add pizazz to any room, and now you can cover any of your electrical box with attractive, American-made works of art. If you need help placing your order, please contact our sales department - we're happy to help. In this close-up image, you can see a silver metal overlay on a black toggle plate. 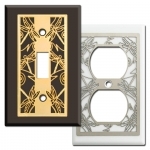 Kyle's custom switchplates are made by adhering metal overlays with her unique etched designs onto quality metal plates. The overlays are acid etched with designs of animals, nature and other artistic renderings. You'll find original designs for laundry rooms, playrooms, bathrooms, bedrooms, dining rooms, entries and more. 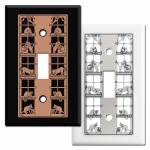 These custom switch plates take a few days to craft by hand, then they're carefully packaged and shipped out in protective boxes that ensure they'll arrive in mint condition. 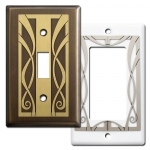 Kyle's unique decorative elements come in 4 attractive finishes. 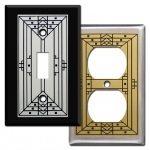 Silver - the brushed nickel silver overlays are popular on black, stainless, white and chrome plates. Brass - Kyle's brushed brass designs feature detail lines in black. 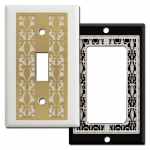 it's a popular choice for black, oil rubbed bronze, ivory, brown and antique brass wall plates. Gold - Polished gold designs are reflective, shiny embellishments without the contrasting black etchings. 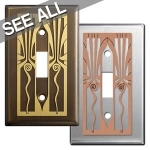 They are often paired with white, stainless, brown and oil rubbed bronze covers. 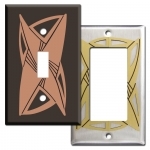 Copper - these striking designs are etched in a brushed copper finish, although not all designs are available in this specialty finish. They blend with coper plates well, but if you're looking to make a statement, consider a contrasting plate like black, almond or brown. Notice that the overall shapes of the sample shown here are different? 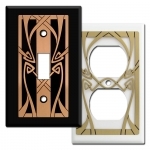 That's because some are for toggle plate openings (like the brass celestial design example), and others are for rocker or outlet plate openings. 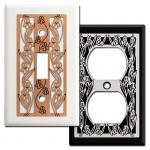 If your base plate is white, almond, ivory, brown or black, it's made from .030" steel and has a smooth, semi-gloss baked enamel finish. 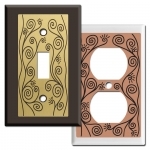 Kyle has chosen these quality, metal switch plates as a base for her artwork because they are durable, won't crack or fade over time, and come in finishes that coordinate beautifully with a variety of electrical device colors. You can find coordinating devices here. 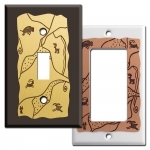 Kyle carries a wide selection of light switches, outlets, dimmers and decorative dimmer knobs to enhance her decorative covers. 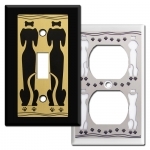 Decorative plates are fantastic for play rooms, bathrooms, dining rooms and entry ways. 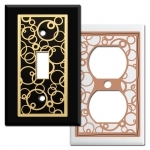 You can swap out your old, dirty switch and outlet covers with fancy new pristine ones and instantly change the feel of any room. Simply remove your old covers, hold the decorative ones up to your electrical box, and screw in using the provided switch plate screws. 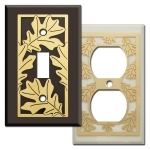 It's that simple - you can transform your living space in less than a minute when you upgrade your outlet covers. 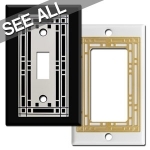 For an even higher end look, consider these specialty finishes for your new decorative wall plate. Stainless steel is extremely popular in kitchens since they coordinate flawlessly with kitchen appliances. Decorative stainless steel plates are residential grade .030" type 430 stainless steel. Finish is brushed satin. Goes well with silver or gold embellishments. Chrome plates are high-polished with a shiny silver finish on durable .030" steel. To match their alluring shine, opt for a polished gold embellishment. 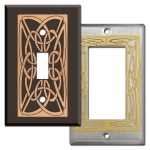 Or, if you prefer more contrast, select brass, copper or silver embellishments with brushed finishes. Oiled bronze plates are made from heavy .040" solid brass. 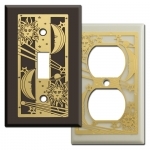 They have a lacquered antique relieved rich bronze finish and are some of Kyle's best selling plates. They look best with brass or gold overlays. Antique brass plates are also a heavy .040" solid brass. The antiqued finish has been lacquered to prevent oxidation. Like the oil rubbed bronze, the antique brass looks astonishing when embellished with Kyle's brass or gold designs. Copper is a trend that has taken over so many kitchens this year and it's stunning! 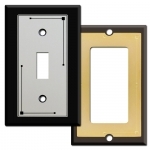 Kyle's solid copper wall plates have a heavy baked lacquer sealant. 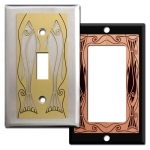 We've seen customers order decorative copper switchplates with copper, silver, gold and brass designs. 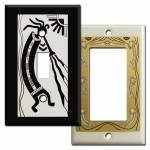 There are hundreds of configurations to choose from when ordering these handcrafted light switch and plug covers. 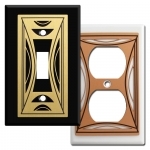 You can cover toggle switches, rockers, GFCI receptacles, duplex outlets, horizontal toggles and all types of dimmers with these unique wall plates. If you want a combination plate with blanks, order an all-rocker plate - such as this triple rocker in photo example - then, fill the extra openings with blank fillers in the same color as your plate. 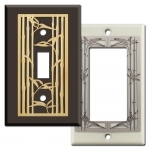 Your decorative switch cover will still be elegant and eye-catching, even if you don't have a device filling every slot.